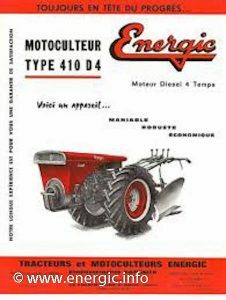 Energic Motoculteur 410 D4 (available after 1/05/1965). Engine/Moteur. Lombardini type LDA 80 monocylinder, 402cm3, 9cv, diesel, 4 stroke engine, Alésage 80 x Course 80. Bosch direct injection. (other models where spec. with a 10cv 377cm3 lombardini moteur). Energic motoculteur 410 D4 bonnet up. Starting. By cord pull front of the engine. Air filter/Cleaner. Metallic element in a oil bath. Gears. 6 forward and 3 reverse gears. Wheels. Pneumatic Tyre wheels 2 sizes 750 x 18 or 650 x 16. Width variable between 64cms and 83 cms. Energic motoculteur 410 D4 engine revealed. Hitch. Articulated pivoted strengthened bar, Breveté system S.G.D.G. (patented in France and the UK), with universal fitment to all ancillary equipment. Enabling the adjustment of draft and other characteristics required to operate the implements at different depths. Plouwing depth. Up to 12 ins (30,48 cms) dependent upon soil conditions. Weight. 450kgs. Additional metal weights can be added +92 kgs. Also you can add water in to the tyres adding a further 66 kgs of weight. Optional equipment. 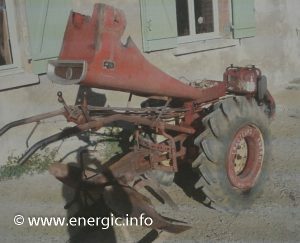 Multi – adjustable Handle bars, differential blockable, Rotivator/Fraise, High pressure reservoir for the the treatment of fruit trees/pulvérisateur haute pression pour le traitement des arbes fruitiers. 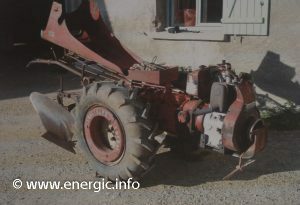 Winch/Treuil, Trailer/remorquages, Grass cutting bar/Bar de coupe. 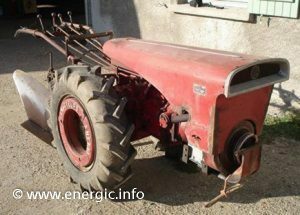 In fact all series 400 equipment – plows, harrows, hoes etc.